You probably haven’t touched a 12-inch ruler since your grade school days, but think back to how that makeshift sword felt in your hand; that’s roughly the same size as a new solid state drive from Intel that stacks 64 memory cells atop each other to create a dense 3D grid packing 32-terabytes of storage. Intel hasn’t released pricing details yet, but it’s safe to assume this noiseless drive will be obscenely expensive, which is why the DC P4500 SSD isn’t designed for the average consumer looking to speed up their desktop PC. It’s instead destined for use in servers and data centers where older hard drives necessitate countless fans and constant air conditioning to operate efficiently, generating lots of noise, and lots of bills. Intel says the DC P4500's ultra-thin form factor “requires half the airflow” for cooling as a more boxy SSD, and just “one-tenth the power” that a typical hard drive demands. 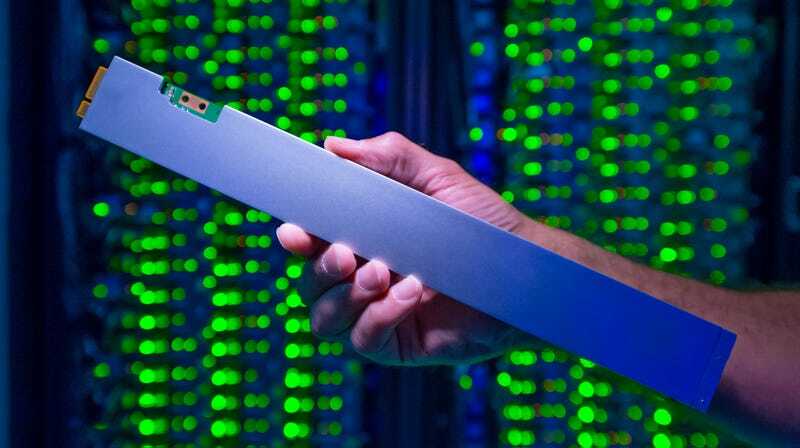 The other big advantage is that inside a standard 1.75-inch tall rack-mountable server box, you could squeeze 32 of these new 12-inch SSDs, maxing it out to a full petabyte of storage. Upgrading an entire data center with the new solid state drives may be a prohibitively pricey proposition, but were a new facility to rely on these SSDs, it could be just “one-twentieth” the size of a traditional server farm, Intel’s blog post suggests, while being cheaper to maintain, cool, and power. As the cloud continues to push the development and improvement of solid state storage further, these advancements will eventually trickle down to our mobile devices. Imagine having 32TB in your phone—you’d never have to delete another vacation video again.